Dr..Stenzler-Koblentz is a Researcher & Internal Relations Manager at ICT. She holds a Ph.D. from Tel-Aviv University, Political Science Department. Her research deals with the issue of democratic states facing terror or guerilla activities with a focus on Israel, United-States and Sri-Lanka. The research provided democratic states fighting these kind of organizations with an operative instrument that defines realistic requirements to help the state maintain its military effectiveness while increasing the legitimacy of its actions in the eyes of the international community, both during and after combat. 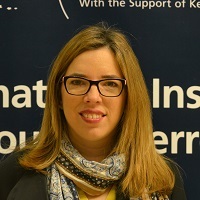 Dr. Stenzler-Koblentz was awarded a prize for her unique research in the field of terrorism, on behalf of Inbar Fund and the Intelligence Heritage Canter. She holds an M.A. from Tel-Aviv University, Security Studies department. Her Thesis deals with the subject of morality of targeted killing in the state of Israel. Mrs. Stenzler – Koblentz was awarded the Fox International Scholarship (2011-2012), on behalf of Yale University USA, the MacMilan Center for International and Area studies, for research that intends to offer practical solutions to problems which stand in the way of the world`s peace and prosperity. During 2012-2013, and while being a doctoral candidate, she held a visiting Assistant in Research position at the Sociology Department at Yale. She has published articles and op-eds for various newspapers and journals. Mrs. Stenzler- Koblentz specializes in issues of Military Ethics, Low Intensity War, Humanitarian Law, Targeted Killing, Just War Theory, Terrorism and Guerilla Warfare. Kite terrorism and incendiary balloons are an issue that has preoccupied Israeli citizens and decision-makers for several months now.